Micah Nunley for D Magazine. The Inwood Theatre first opened in 1947 and still retains its historic charm, thanks to a careful renovation in 2005, during which the historical murals and structural integrity were kept in tact. 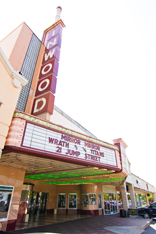 Owned by Landmark Theatres, the Inwood primarily shows independent and foreign language films on its three screens. As popular as the theater itself is the Lounge at the Inwood Theatre, a cool bar where the locals have been drinking martinis for years.